SpaceX founder and CEO Elon Musk discusses the company's successful Falcon Heavy rocket test launch on Feb. 6, 2018. On Sept. 27, the U.S. Securities and Exchange Commission filed fraud charges against Musk, based on statements he made about perhaps taking his electric-car company, Tesla, private. The U.S. Securities and Exchange Commission (SEC) is suing Elon Musk for fraud. The charges stem from statements Musk made on Aug. 7 indicating that he was considering taking his publicly traded electric-car company, Tesla, private, according to the lawsuit, which was filed today (Sept. 27) in New York. 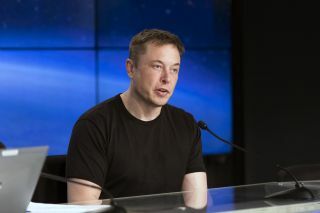 "Musk's statements, disseminated via Twitter, falsely indicated that, should he so choose, it was virtually certain that he could take Tesla private at a purchase price that reflected a substantial premium over Tesla stock's then-current share price, that funding for this multibillion-dollar transaction had been secured and that the only contingency was a shareholder vote," SEC officials stated in the lawsuit, which you can read here. "In truth and in fact, Musk had not even discussed, much less confirmed, key deal terms, including price, with any potential funding source," SEC officials added. "Musk's false and misleading public statements and omissions caused significant confusion and disruption in the market for Tesla's stock and resulting harm to investors." The lawsuit does not involve SpaceX, the spaceflight company that Musk founded in 2002 (and for which he serves today as CEO and chief rocket designer). "This unjustified action by the SEC leaves me deeply saddened and disappointed," Musk said in a statement to CNBC. "I have always taken action in the best interests of truth, transparency and investors. Integrity is the most important value in my life, and the facts will show I never compromised this in any way." CNBC has many more details about the SEC lawsuit; check them out here.